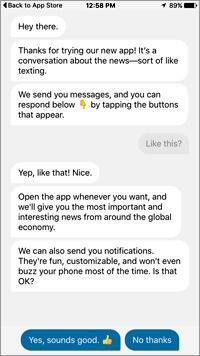 Quartz’s new iPhone app that transforms the news consuming experience into an interactive chat has been given a big thumbs up by media commentators. Quartz, which is owned by Atlantic Media, prides itself on its originality in delivering news – its pioneering daily email newsletter has nearly 200,000 subscribers – and its newest innovation doesn’t disappoint. Writing in Techcrunch, Jon Russell says that “using a clear and clean design aesthetic, the Quartz botBotSoftware that runs automatically without human intervention. Typically, a bot…//read more interacts with you, offering up news stories which you can choose to get more information about or move on to the next.” A simple chat interface lets users decide on the level of detail – if you want, more just ask for it. The app has been rolled out for iPhones, with Android to follow soon. For Mathew Ingram, writing in Fortune, “it looks and feels dramatically unlike almost every other news app available.” Its simplicity is its appeal, and the experience of using it is like a personal conversation. “There’s no front-pagePageA document having a specific URL and comprised of a set of associated files. A…//read more style list of headlines and images, there isn’t even a time-sorted feed of stories. There’s just what looks like a friend texting you, asking you in speech bubbles (complete with emojis) what you are interested in reading about.” You navigate by replying with simple phrases like ‘tell me more’ or ‘what’s next’. Another bonus is that it’s ad-free, except for a sponsor’s message at the end. Conversational flow: it creates an immediate bond with users because it’s so familiar. User-controlled experience: With an option to direct the experience by clicking on emojis, it makes you feel like you’re in control – it’s more conversational than disruptive. Conversational advertising: Over time, it will be possible to build a robust profile of users based on their interactions and integrate advertising as part of a conversation. Edwards finishes by saying: “Kudos to the Quartz team for delivering a highly conversational approach to information overload and understanding the importance of empowering the consumer.” High praise indeed. The Quartz app for iPhone can be downloaded here.